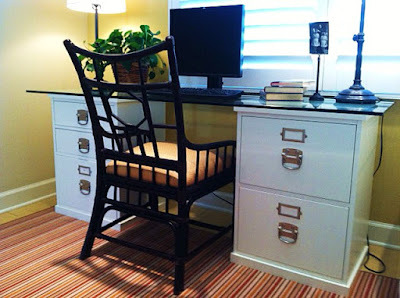 Sometimes the simplest or even the plainest things can become a piece of stylish furniture. Instead of a tradition desk, aren't these two white metal cabinet files with a glass top just stylish? This way, the always useful, but sometimes bulky and ugly storage cabinets can become a piece of snazzy furniture. Glass top can be replace with a wooden top instead. I often hear friends complain about their file cabinets, but I bet they won't complain about these cabinets at all. This way, we get to save money, and create style at home, all with functionality in mind. What do you think? I’m giving away a leather and sterling silver jewelry piece this week. Don't miss it, darling! That is actually a pretty fantastic idea. I'm really shocked I had never heard of it being done before! that is actually completely ingenious! i love it! Very Savvy! I love this idea!